Who doesn’t love getting an unexpected bonus? When I was a child, that meant a cool prize in the Cracker Jack box. Now, it means buying a 4-pack of toothbrushes and getting 5th one free, am I right? I have something a little more exciting than toothbrushes for you today. 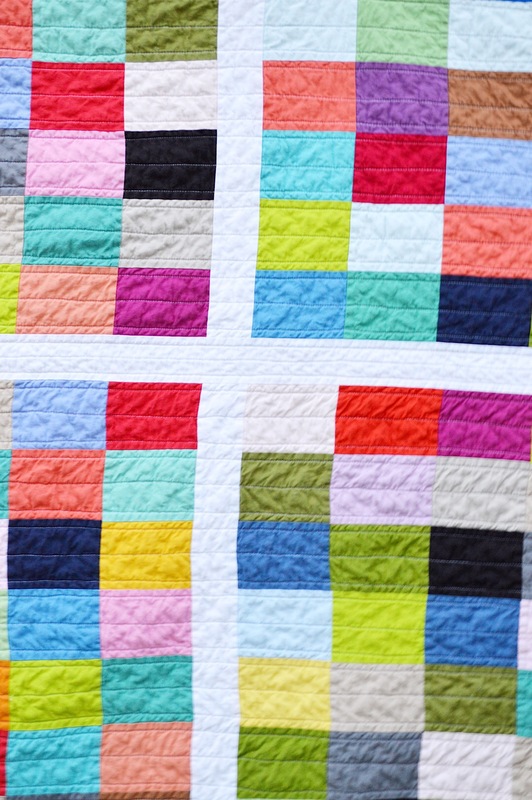 Recently, I shared with you the Off-Line Modern Strip Quilt Tutorial. 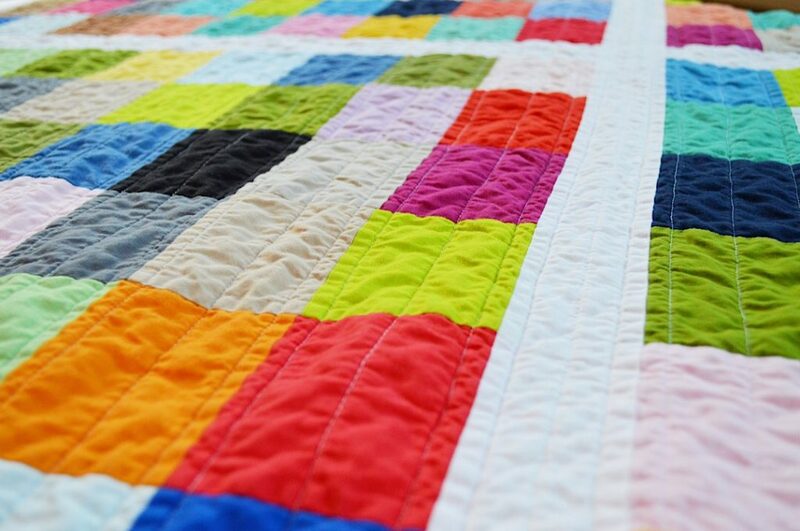 This was a bold, bright, and extremely simple quilt to assemble because it was made up entirely of 3.5” strips sewn together in groups of three. Now here is where our bonus comes in. 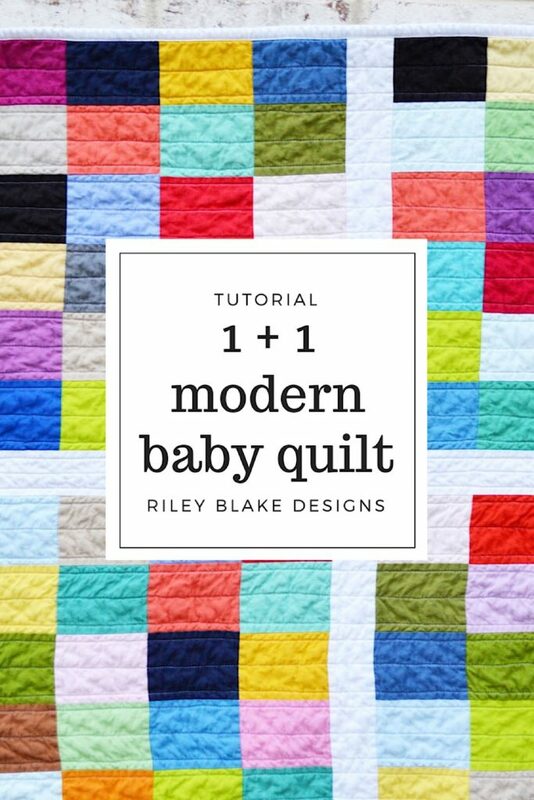 This fun 1+1 Modern Baby Quilt was made up almost entirely of scraps leftover from the Off-Line Modern Strip Quilt. Now how’s that for simple! All of these little rectangles are really cut directly from those long strips of fabric. You could make up a whole quilt with these blocks and it would look fabulous. I decided to add white strips of fabric, forming a large + sign, just a little off center to add interest. I used Riley Blake Designs Confetti Cottons for the entire quilt front. I love the huge selection of colors, and I especially love how nice they look and feel after being washed and dried. Let’s get started making this quilt. You won’t believe how simple it is! *Use 1/4” Seam Allowance on all seams. *Strips of 3.5” fabric. The length can vary. 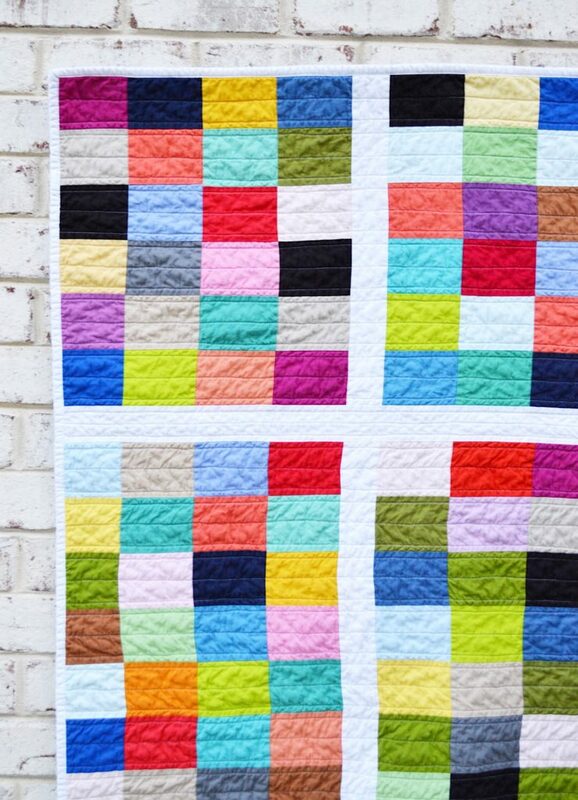 Use scrap fabric, already sewn units of 3 from the Off-Line Strip Quilt Tutorial, or use strips cut from yardage. We are going to begin with our strips of fabric, sewn into groups of 3 leftover from the Off-Line Quilt Tutorial. 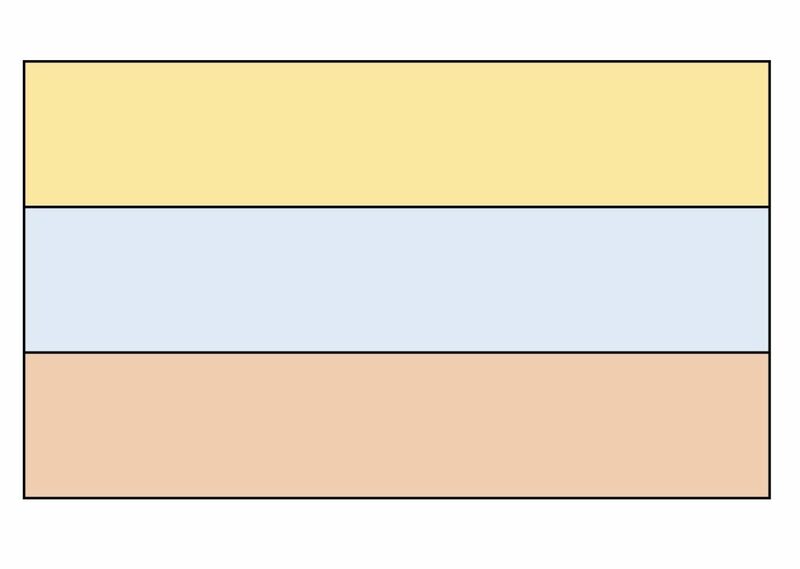 If you didn’t make the Off-Line quilt and don’t have these leftovers, go ahead and sew your 3.5” strips of fabric together in groups of three as shown above. 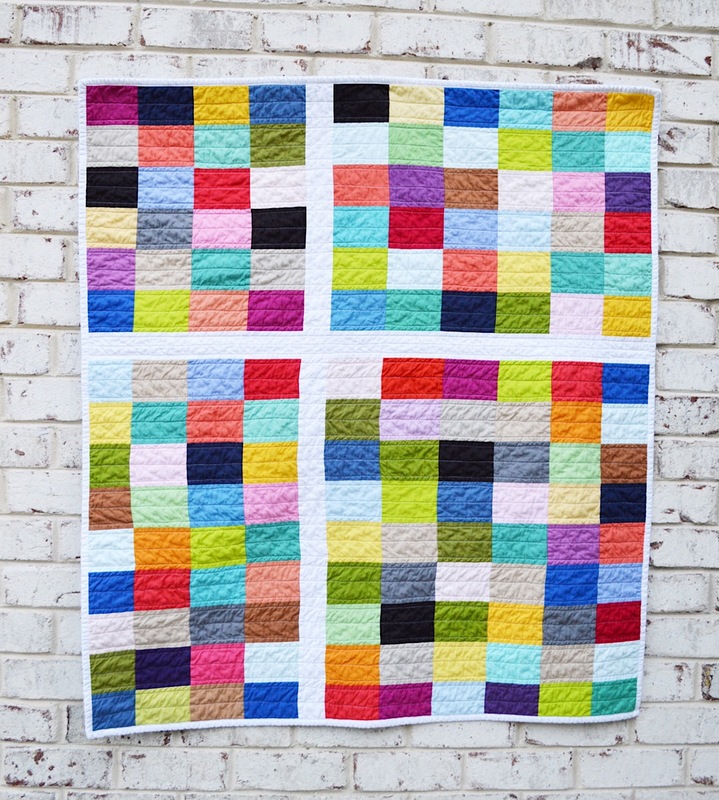 You’ll want to group contrasting colors together to achieve the random, disorganized look we are going for in this quilt. If you are sewing scraps together, try to group scraps of similar length together. Once your 3 strips are sewn together, press the seams in the same direction. Next, we are going to cut smaller rectangles measuring 4.5” wide from these strips. You will end up with blocks measuring 9.5” x 4.5”. Repeat this process of joining three 3.5” strips together and cutting into 4.5” lengths until you have fifty 9.5” x 4.5” blocks. 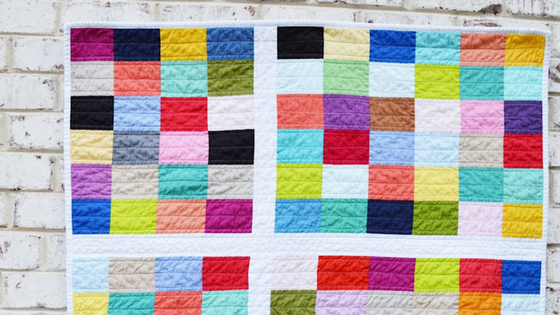 Now that you have your blocks, it’s time to start assembling the quilt. We are going to begin with the top left quadrant. 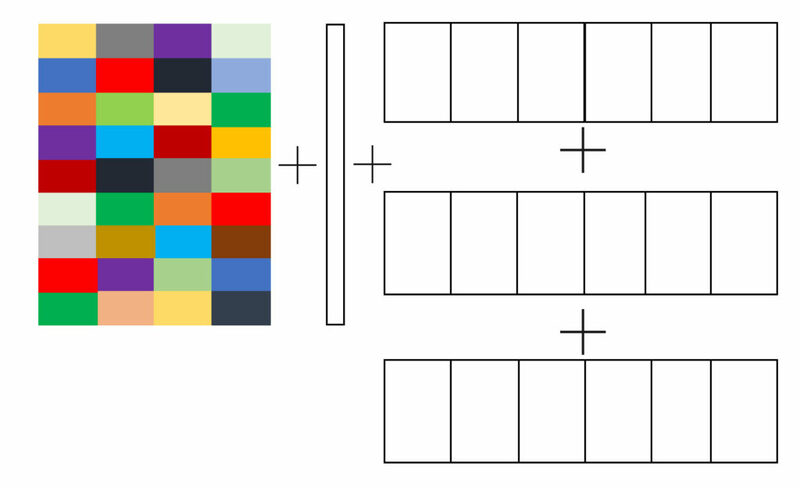 Arrange 4 blocks in a fairly random order. 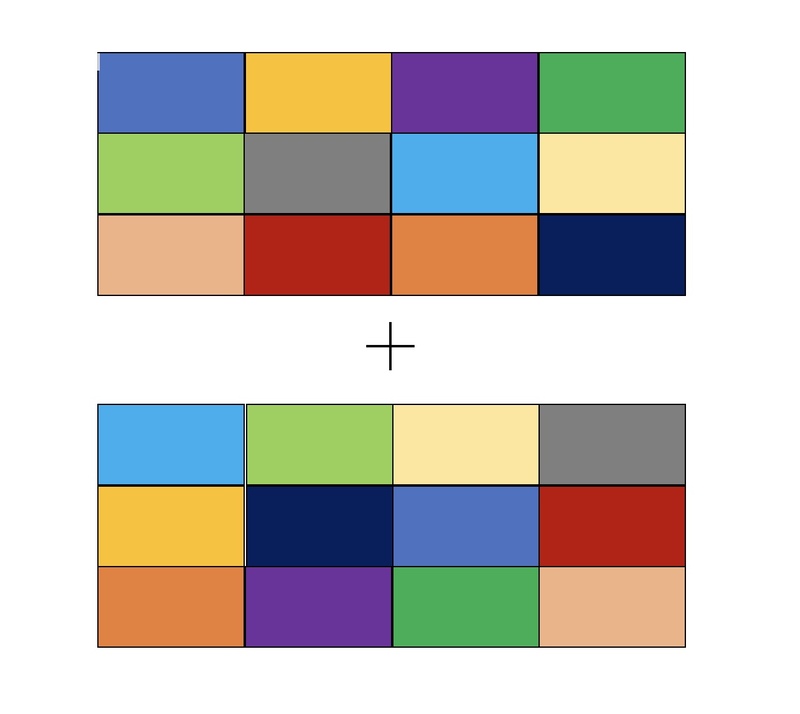 The only thing you don’t want to see is two rectangles of the exact same color side-by-side. Other than that, try to keep it random. Clashing colors is exactly what we are looking for here! Sew the 4 blocks together. Press seams. Repeat with a second row. Sew the two rows together. Press seams. 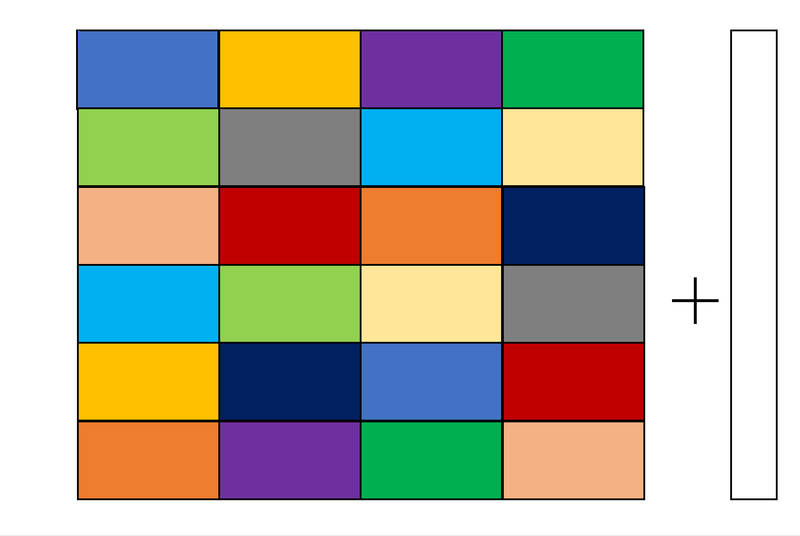 This will form the upper left quadrant of your quilt. Now it’s time to sew your upper left quadrant to the 2.5” x 19” strip of Riley White Confetti Cotton. Press seams. For the upper right hand quadrant, sew together 6 blocks across, pressing seams as you go. Repeat for 2nd row. You now how 2 strips of 6 blocks each. Sew the 2 rows together along the long edge of the strip of blocks, forming one large rectangle. Press seams open. Sew the short end of the rectangle to the raw edge of the white fabric divider strip. Join the white 2.5” x 40” strip to your top section. Press seams. Set aside. Assemble the bottom left quadrant. You will sew 3 rows of 4 blocks. 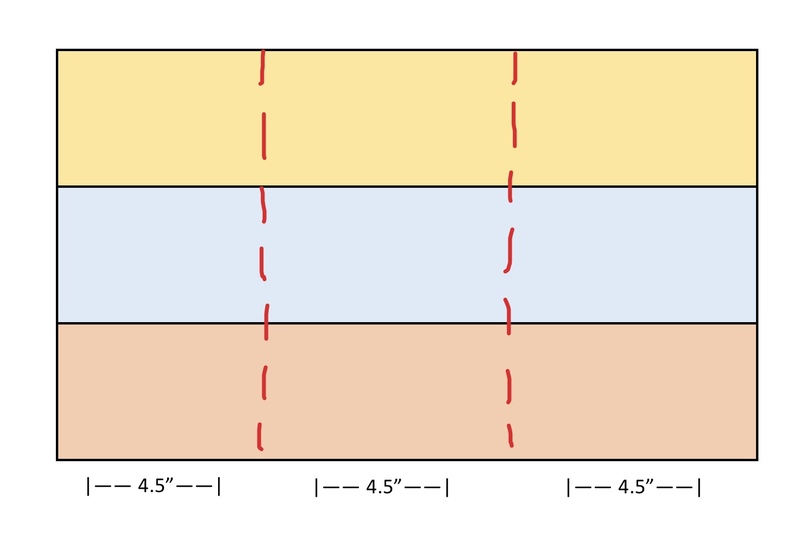 Following the diagram above, add the 2.5” x 26” strip to the right side of the bottom left quadrant. 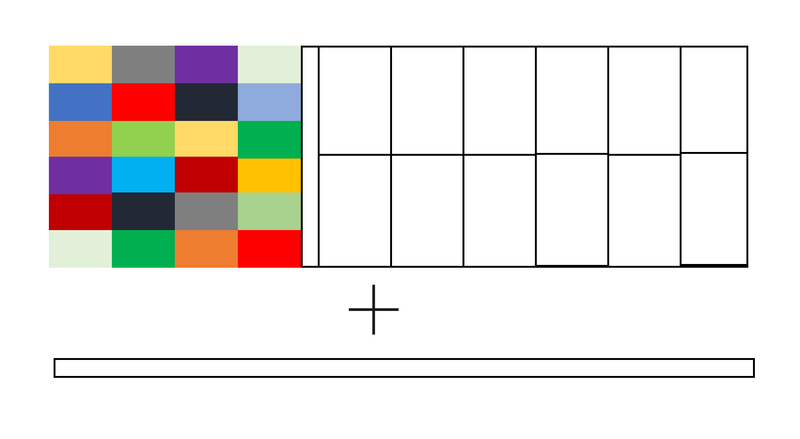 Sew the bottom right quadrant in the same way as the left quadrant, except you will be making 3 strips of 6 blocks. 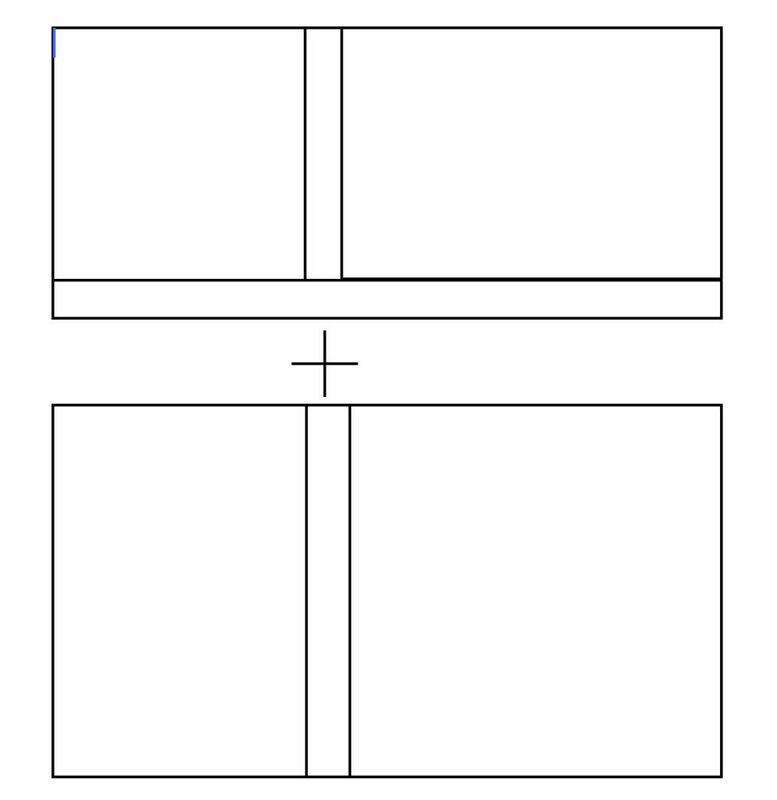 Attach the finished bottom right quadrant to the raw edge of the white divider strip. Finally, join the top and bottom sections as shown above. Press seams. Make your quilt sandwich (quilt back + batting + quilt top). Baste. 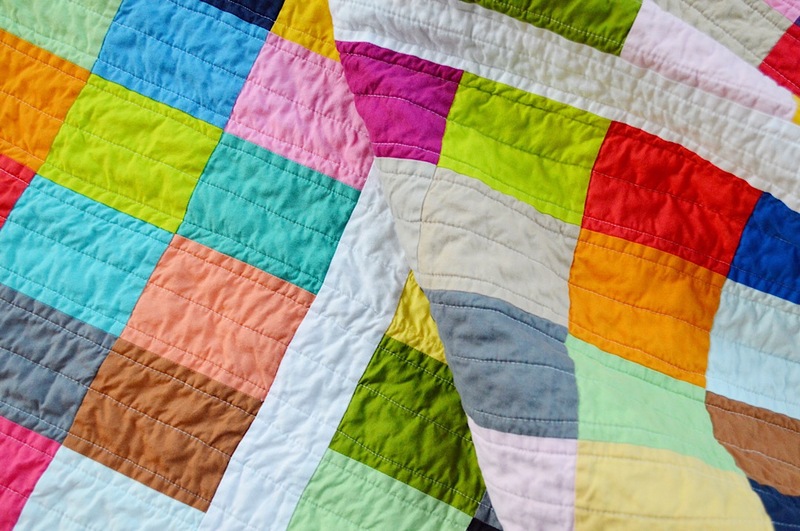 Quilt by hand, by machine or take it to a professional quilter to be quilted. Bind the quilt by hand or by machine. Amy Smart, of Diary of a Quilter, has put together an easy-to-follow MACHINE BINDING TUTORIAL. That’s all there is to it! I quilted this using not-so-straight lines. I stitched 1/4” on either side of the seams, then ran another stitch through the center of each row. 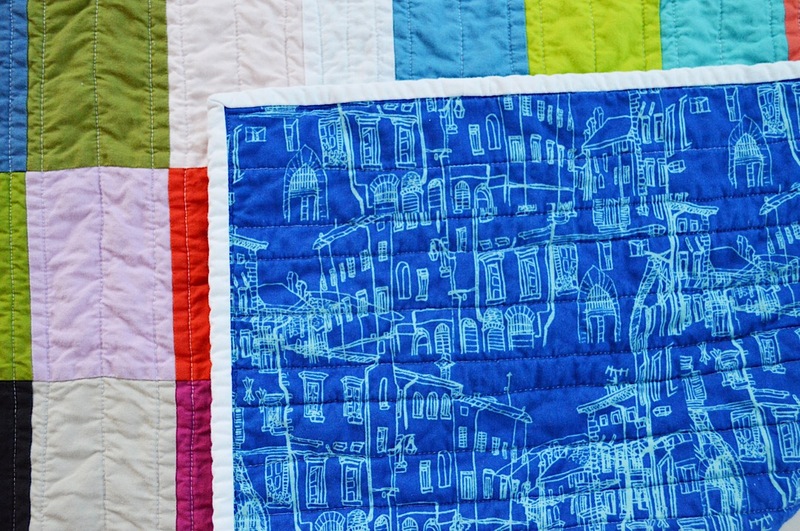 The quilt back is “Paris Buildings” in blue — part of Riley Blake Designs’ “Pepe in Paris” fabric collection. I seriously LOVE this print. The bright color and architectural sketches work nicely with the colorful, modern quilt top. The binding is the same Riley White Confetti Cotton fabric used in the 2.5” divider strips. Riley Blake Confetti Cottons can be found at your local or online quilt shops. Let’s Bake Sew Along: Week 3!